Governor Bruce Rauner today signed Senate Bill 210 which creates the Bath Salts Prohibition Act to help curb the growing number of people selling and consuming synthetic cathinones, popularly known as “bath salts”. 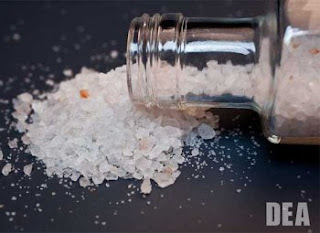 Bath salts are chemically similar to amphetamines, cocaine, and MDMA, and they produce effects such as paranoia, hallucinations, increased sociability, panic attacks and excited delirium. They are often sold disguised as common bath salts and have been sold in convenience stores, smoke shops and similar businesses. They are known to be addictive. “This bill is a small step towards tackling what remains a devastating issue in our communities. These highly addictive synthetic drugs continue to wreak havoc on our communities and throughout the country," said Rep. Avery Bourne (R-Raymond), sponsor of the legislation. "It is my hope that this new law will limit access and spark discussions on how we can continue to crack down on this epidemic." Senate Bill 210 states that a person may not sell, or offer for sale, any bath salts in a retail establishment in Illinois. It is a Class 3 felony if the Act is violated, resulting in a potential fine not exceeding $150,000. In addition to any penalty that may be imposed for a violation of the Act, the unit of local government that issued a retailer's license for the retail establishment who violated the Act may revoke that retailer's license. Use of bath salts has been on the rise across the country for the last decade. Two variations of the drug were outlawed in the United States in 2012, but new chemical compounds have been introduced. SB 210 goes into effect on January 1, 2017.